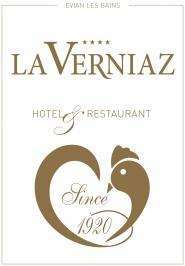 La Verniaz offers 40 rooms, a tailor-made catering offer with the possibility of organizing cocktails, meals in the privatize Rotunda and meeting rooms in a charming setting. La Verniaz**** offers you 33 bedrooms, one nuptial suit and 6 chalets (3 for couples and 3 for 6 guests) available for your guests. Located at the heart of a park filled with flowers, equipped with an outdoor swimming pool and a tennis court, our terraces and fountains that will make you immediately fall in love with the place. For the catering, the chef awaits you for a trip to the heart of inventive, local and traditional flavors. Specialized in the rotisserie, discover incomparable tastes.